Weekly Winner: Addictively Zingy Beef … no really! So I realize that December should be “Every Other Week Winner” but travel has been an almost weekly occurence this month and I just haven’t done my usual amount of cooking. And, I’m getting a little cranky about it too! Cooking calms and centers me so I was terribly happy to get back in the kitchen this Sunday after returning from a week in Hawaii. Yeah, I know… tough duty. You’re feeling real sorry for me right about now, aren’t you? Anyway, so last night I was anxious to get the pots and pans going again and decided to whip up this dish from Bon Appetit – Thai Beef with Basil. Oh, my! It was like I simply could not stop eating it! The lime and the fish sauce added zing, the chile added a bit of heat, and the carrots, which are not cooked, added an amazing crunch and freshness. 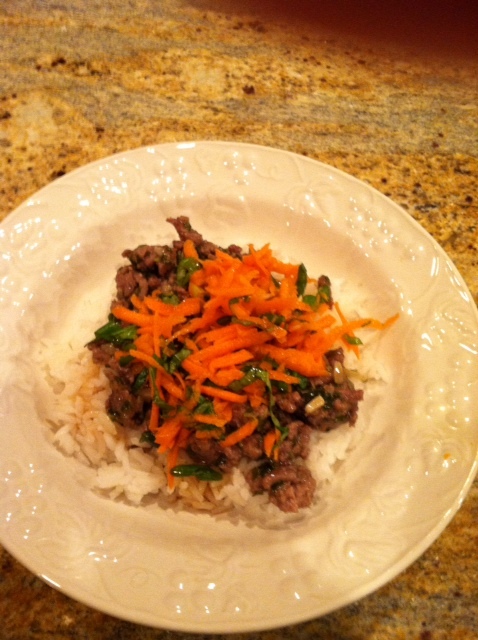 It is not your typical beef and basil dish but it well worth a try! Heat 1 Tbsp oil in a large skillet over high heat. Add garlic and 1 chile and cook, stirring until fragrant, about 30 seconds. Add beef, season with salt and pepper and cook, breaking up with a spoon and pressing down firmly to help brown until cooked through and nicely crisped in spots, 8-10 minutes. Add broth and 2 cups basil and cook, stirring, until basil is wilted, about 2 minutes. Toss carrots, scallions, 1 tbsp lime juice and remaining chile, 1 cup basil leaves and 1 tbsp oil in a small bowl. Mix soy sauce, fish sauce, sugar, and remaining 3 tbsp lime juice in another small bowl until sugar dissolves. Top rice with beef and slaw and drizzle with soy dressing. Serve lime wedges alongside for squeezing over. Yes, I realize I have been shamefully absent lately. It’s that time of year, you know. Running around like crazy, traveling, making holiday plans. Holiday plans?? How can it possibly be December? I honestly don’t even remember October and I thought November had barely gotten started. Oh well. Tis the season for comfort and joy and all that stuff. Which is exactly what this soup is … a bowl of comfort and joy….. and bacon! There is not a potato or potato product that I don’t like. And when you top it with cheese and bacon, really it can only get better. Did I mention the bacon? Anyway, the recipe is dead-simple which I think we can all use right around now and it is warm, creamy, healthy and amazingly low-calorie — all of which is definitely a good thing about now as well. Oh yeah … and it has bacon. Sorry. I digress. The recipe comes from Cooking Light Magazine. Whip yourself up a bowl and ponder where in the world the time goes. Place potatoes, cut sides down, in an 11×7 inch microwave-safe baking dish. Add ¼ cup water; cover with plastic wrap. Microwave on HIGH 15 minutes or until potatoes are tender. Cool slightly; discard potato skins. Heat a saucepan over medium-high heat. Add oil; swirl to coat. Add onion; sauté 1 minute or until translucent. Stir in cumin and red pepper. Add stock to pan; bring to a boil. Place half of sweet potato and half of stock mixture in a blender. Remove center piece of blender lid; secure blender lid on blender. Place a clean towel over opening in blender lid (to avoid splatters); blend until smooth. Pour pureed soup into a large bowl. Repeat procedure with remaining sweet potato and stock mixture. Stir in salt. 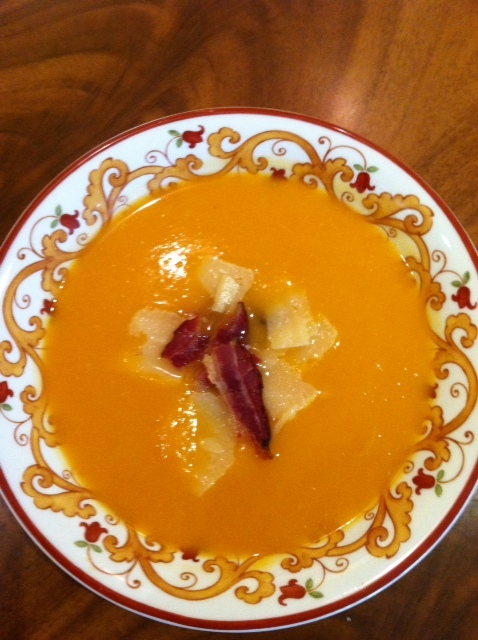 Divide soup evenly among 6 bowls; sprinkle cooked bacon and parmesan over top. Garnish with parsley.